The new 35,000 sq. ft. Pacific Seas Aquarium in Tacoma, Washington, highlighting the Pacific Ocean ecosystem, opened to the public on September 7th. American Zoo and Aquarium Association (AZA) members were able to visit the new aquarium as part of the annual AZA post-conference tour. The $51.6 million dollar project includes twenty new aquariums that house aquatic species from the Sea of Cortez, to coastal Japan, up to the Puget Sound. The largest exhibit, a 250,000 gallon Baja Bay warm-water exhibit, is inhabited by hammerhead sharks, green sea turtles, and spotted eagle rays. Visitors can view the exhibit from multiple perspectives including an “underwater” acrylic panel that arches overhead. Coral substrate shelving and various faux coral provide a naturalistic underwater setting. A Northwest waters exhibit holds nearly 100,000 gallons and highlights local marine life. The artificial rock and pilings are now home to numerous marine invertebrates. The kelp forest aquarium displays kelp species similar to what is found off the coast of Southern California. A “hands-on” tidal touch zone offers up-close experiences for patrons to view and touch marine life. The new aquarium also offers interpretive exhibits that focus on conservation and connects patrons to oceans and ocean life. Near the aquarium’s entrance, an outdoor 4,500-gallon tidal surge tank serves as the new home for sea stars, anemones, and urchins. COST’s scope included shop drawings for nine aquatic habitats as well as models for these habitats. Once approved, COST crews constructed decorative shotcrete and FRP simulated rockwork, coral substrates with warm water coral (Stony, Gorgonian, Cauliflower coral, etc. ), a collapsed bridge feature, and faux wood pilings, among other finishes. 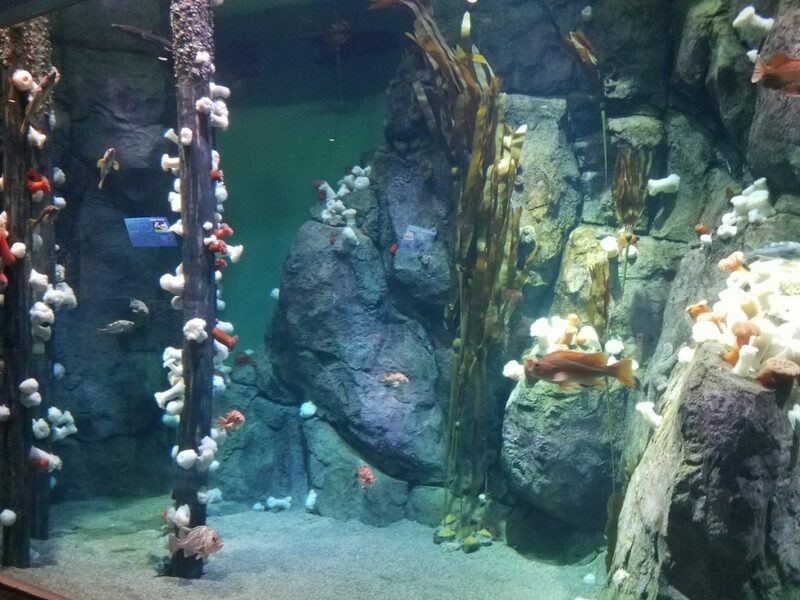 The project team included; Boston-based Lyons- Zaremba, exhibit design, EHDD Architects, Turner Construction, general contractor, and COST of Wisconsin, Inc. More information on the new aquarium can be found at link.